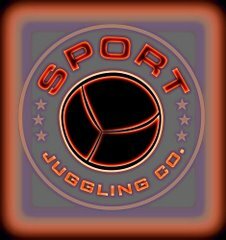 I'm Michal "The Joggler" Kapral of Toronto, Canada, and I run marathons while "joggling," which is an actual sport that combines jogging and juggling. I hold the Guinness World Record of 2:50:12 for the fastest marathon while juggling three objects. And yes, I also chewed gum every step of the way. Life is a joggling act. Welcome to the drama, the pain, the heartaches, the headaches, the insanity and the joy that is joggling. This blog will track my journey as I attempt to reclaim the Guinness World Record for "fastest marathon (26.2 miles) while juggling three objects," and any future joggling feats. On April 21 at the Salt Lake City Marathon, I'll be facing off against my great joggling nemesis (and friend) Zach Warren of West Virginia in the world's second-ever marathon joggling duel. The first battle took place at last year's Boston Marathon, featuring – you guessed it – Zach and me. Zach beat me in a world-record time of 2 hours, 58 minutes. Five months later, I reclaimed the marathon joggling title in my hometown, at the Scotiabank Toronto Waterfront Marathon, shaving a minute off the record with a 2:57. Then, just six weeks later, Zach joggled an astounding 2:52 at the Philadelphia Marathon. That's the time to beat. So the race in on, and the venue is set for the next joggle-off. Come along for the ride as I joggle for Guinness glory. Hey. 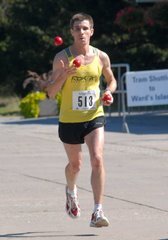 I'm Michal "The Joggler" Kapral and yeah, I'm that guy who runs marathons while juggling, or joggling, as it's called. Actually, there are a bunch of us who do this, but I'm the one who holds the Guinness World Record for the fastest joggling marathon. I've appeared on ESPN, Good Morning America, CNN, ABC, CBS, NPR and dozens of other TV and radio programs, and in the documentary "Breaking and Entering," directed by Benjamin Fingerhut. My joggling marathon record stands at 2:50:12, set at the 2007 Scotiabank Toronto Waterfront Marathon. I also joggled the whole race while chewing gum, just to prove it to all the people who yelled out to me: "Yeah, but can you chew gum while doing that?!" Yes, I can. In October, 2012, I became the first person to take first place overall in a marathon while juggling, winning the Trapline Marathon in Labrador in 2:59:32. in 2016, I set the unofficial record for fastest joggling marathon without a drop, running and juggling the Chicago Marathon in 2:55:25. In 2015 and 2016, I appeared in national network TV commercial for Fairfield Inn and Suites by Marriott. Contact: joggler1@gmail.com. Who are the best jogglers in the world?